I rode up the lift with a gaggle of Mighty Mites. Gaggle? Is that the right word? A mass, a bunch, a whole lot of mighty, little wiggling skiers. After a quick pit stop to the candy counter, they were exchanging Sour Skittles, Scores, M&Ms, Nerds, and various other sugar concoctions. The gloves and mittens were flying. It was just a matter of time before one would land fifty feet below - amid a pile of fluffy white powder. Kate was swapping sugar with the best of them. But she had a unique solution to the flying glove factor: elastic hairbands connected her gloves to her wrists. "It's simple. You wrap elastic hairbands around the tag or clip, then you put the bands around your wrists. 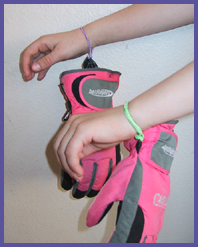 When you take off your gloves, the band stretches, but keeps the glove from dropping," says Kate. And sure enough, the gloves dangled from her wrists without danger of dropping off into never never land.